Although certain Contemporary Art Month exhibitions carry over into April and beyond (there’s still plenty of time to take in standout shows like “Reflections on Landscape and Memory” and “Ángel Rodríguez-Díaz: A Retrospective, 1982-2014”), the citywide celebration familiarly known as CAM officially draws to a close on Friday with an outdoor shindig in the Linda Pace Foundation’s quaint CHRISpark. 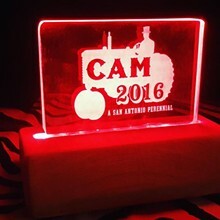 Three decades strong, CAM made some important tweaks this year, including roping in San Antonio institutions — SAMA, the McNay, Artpace, Blue Star Contemporary, Southwest School of Art, Guadalupe Cultural Arts Center and the Carver — to weigh in on all but one of the winners of the CAMMIE Awards. Previously determined exclusively by online voting, these decidedly niche awards recognize outstanding projects and concepts with trophies created by local creative hub Make San Antonio. (Contemporary art fans can still vote for their favorite “artwork, exhibit or event” in a Best of CAM category through midnight on March 30.) Doubling as the closing reception for the Spare Parts Mini Art Museum’s new printmaking show “Fine Print” (featuring limited editions of wee works by Amada Claire Miller, Michael Menchaca, Jennifer Ling Datchuk and more than a dozen others), the free, family-friendly affair enlists local performer Rick Frederick as emcee and tempts guests with shakes from HoneySuckle Teatime and beer, wine and cocktails courtesy of Bellion Spirits.